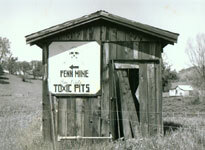 Mine in Calveras County, Photo: Bob Dawson/ Farewll, Promised Land Project, 1995. On the first Friday of 1884, Lorenzo Sawyer, federal circuit judge in San Francisco, walked into his courtroom at precisely 11 a.m. and read out his decision in the case of Woodruff Vs North Bloomfield, changing the course of California's mining history in the 19th century. Throughout northern California, people gathered around the telegraph offices to await the verdict of the bitterly fought case that had pitted the growing muscle of the farmers of Sacramento valley against the miners of the mountain towns of the Sierra Nevada. At stake was the practice of "hydraulic mining" - a process by which enormous jets of water were blasted under high pressure at mountain sides and river banks to pulverize them in the search of a few flakes of gold - causing vast quantities of sediment to bury houses, orchards and wheat fields downstream. In 1880 alone some 40,000 acres of farmland and orchards were destroyed while another 270,000 were severely damaged. All told some 12 billion tones of earth were blasted out of the hills and washed into local rivers. "Exactly at one o'clock the first message was received, announcing in the most positive terms, a complete victory for the valley. In a few moments the steam whistle at Swain & Hudson's mill began a shrill and prolonged shriek ... soon the church bells were ringing out the most joyful peals ever heard in Marysville," reported the local newspaper. The town of Marysville, which had been completely buried in muck in 1875, threw a huge party that night with marching bands, fireworks and bonfires in Cortez square. Celebrations broke out in farming communities around the state like Bakersfield, Chico, Colusa, Merced, Red Bluff, Stockton and Wheatland. For the Anti-Debris Association, the organization created on August 24, 1878 in Yuba city by angry farmers, to take on the powerful mining interests in the mountains, the Sawyer decision was the crowning achievement of their long battle to shut down the mines completely. It was, arguably, the first major environmental decision in the United States. Although the decision would take decades to implement, it was the death toll for the mountain miners who had revived the dying days of California's Gold Rush in the 1860s and 1870s with powerful and destructive technology. Ironically the four men who finally closed down the hydraulic industry - Lorenzo Sawyer, James Keyes and George Ohleyer, the leader of the farmers, and their lawyer George Cadwalader - were all miners at some point in their lives. Sawyer himself was a '49er, Cadwalader and Ohleyer, also arrived the California Gold Rush while Keyes worked in the Nevada mines. At the time most mining was done by pick and shovel above ground or in 100-foot deep shafts, lit by candlelight. Like most of the argonauts, all four men soon realized that they would never make a fortune in the Gold Rush. They soon abandoned the mines: both Cadwalader and Sawyer went to work in Sacramento law firms while Keyes and Ohleyer became farmers near Yuba City. In 1852 and 1853 Anthony Chabot and Edward Matteson, two miners near Nevada city who were working at Buckeye Hill and American Hill respectively, devised the first hydraulic mining technology by building a wooden contraption held together by iron clamps that allowed miners to capture a fifty foot column of water that could then be directed through a canvas hose at a gravel bank, allowing them to break it up and wash it into a series of sluices where the heavy gold flakes settled out of the lighter earth. The new system sped up the search for gold. The hoses could break up gravel banks in a matter of hours that would previously have taken weeks for a team of miners working with picks and shovels. The high gravel ridges above the American, the Bear, the Feather and the Yuba rivers, immediately attracted the argonauts who were still pouring into California. New mining towns sprang quickly into existence. "The typical hydraulic town was a collection of canvas-walled hotels and saloons, strung along an unpaved street which was a quagmire in winter and deep in dust in summer," wrote Robert Kelley, the author of "Gold Vs Grain" - the classic study of the fight between farmers and miners. The initial hydraulic Gold Rush did not last because the technology did not allow the miners to break up the more densely compacted gravel, so settlers soon left to join the silver stampede to Sun Mountain, Nevada, in 1859, and further north to Idaho and British Columbia. In 1861 a new "crinoline hose" was introduced - made of double thickness canvas bound with iron hoops - allowing miners to triple the pressure that they had applied before. Although a three-year drought slowed down the introduction of this technology, the December storms of 1864 brought miners back into the mountains. The mining industry soon further developed their destructive technology with the invention of the steam-powered Blatchley diamond rock drill and the "Little Giant" hydraulic monitor in 1870, a device which was similar to a piece of artillery that could force out water at a pressure equal to a 500 foot column of water. These "hydraulicking" machines and mines were financed mostly by wealthy San Francisco investors. For example William Ralston, one of the silver kings who made his fortune digging up Sun Mountain in Nevada, and Lester Robinson, a railroad baron in San Francisco, set up the North Bloomfield Gravel Mining Company in 1868 which absorbed some 3.5 million dollars in investments before producing gold in 1878. The company even built the first long distance telephone line in the United States; it stretched 60 miles. Not until it was shut down in February 1884, the mine turned a profit of 2.8 million dollars. Other powerful businesses at the time were the San Francisco-financed water companies, like the South Yuba Canal Company, the Excelsior, the California Water Company, the Eureka Lake and Yuba Canal company. These and other companies built 5,276 miles of flumes, canals and ditches over the next three decades to supply water to the miners. Also deeply committed were British investors who poured millions of dollars a year into the mines in the 1870s like the Birdseye Creek, the Cedar Creek and the Little York mine. Within a few years the impact was felt downstream. "Out of the streaming Sierra Nevada came a gigantic mud flow. The tailings dumped into the mountain canyons in the fifties had made their first invasion of the flatlands, and an anguished cry came from the valley as brown waters swept over unprotected farms and towns," wrote Kelley. The mining debris that resulted from this "hydraulicking" choked the once clear mountain streams. The Sacramento River swelled into a turbid sea some 50 miles wide. All told hydraulicking dumped soil of a volume equal to eight times the volume of earth dug to create the Panama Canal. Most threatened by this debris were the two towns of Marysville and Yuba City which were situated where the Feather River meets the Yuba River. The communities there were rudely wakened to the threat from the mountains in early January 1875 when a storm deluged the region for a week. "By the morning of the 19th the swollen brown waters of the Yuba were rushing along near the top of Marysville's levees. With the fire house bell ringing in their ears, men rushed out of their homes and flung themselves into a nightmare struggle to save the city. Near the cemetery, despite frantic efforts, the river began slipping over the levee and pouring down into town. By nightfall people were rushing wildly for safety; at eight o'clock the levee broke near the hospital, and a torrent of water rushed into the streets. In wild confusion women and children were rescued, barn sheds and frame houses began floating about and a little boy drowned. By the following noon the city had filled like a bowl," wrote Kelley. At a December 18, 1875, meeting in Yuba City, farmers estimated that the damage from flooding over year had destroyed 26,000 acres of cropland along the Bear and Yuba rivers at a cost of 5.5 million dollars. Levee building costs added another million dollars to the bill. James Keyes echoed many of the other farmers at this meeting when he announced: "I have no objection to the miners digging all the gold they can find but I don't want them to send the whole hill down upon my ranch and bury me and all I have. And that is just what they have done and are doing. I want to be let alone." Meanwhile mining country newspapers mocked the farmers. "The valleys need soil that will produce potatoes," wrote the Grass Valley Daily Union, pointing out that the miners had arrived before the farmers. "The farmers of the valley ... fail to remember that they located down on those farms after the miners had acquired rights above on the streams. Among the rights acquired by the miners was that of 'dumpage' into the tributaries of the rivers." Cadwalader, Keyes and Ohleyer filed the first of many lawsuits against the British-owned Little York mine in July 1876. The lawsuit galvanized the miners to fight back. They met with the water companies and mining entrepreneurs in San Francisco in September 1876 to form the Hydraulic Miners Association. In February 1878 the rivers rose again. "The fundamental elements of the scenery, from first to last, were a wild waste of waters, fringes of willows, parks of oaks, broken levees, rows of earth bags ... the great sea seems to extend on the one side to the Coast Range foothills and on the other to the Sierra ... farms were cut up into gullies, with narrow strips between, and the stock was wandering and lowing over these patches, looking in vain for food ... The water was rushing around nearly all the houses, and the beautiful orchards were either in the water or covered up with slime," wrote a reporter who traveled to see the damage caused by the Sacramento river. That August the farmers formed the Anti-Debris Association that would eventually shut down the mining industry. The Anti-Debris Association went as far as to create an Anti-Debris Guard in Sacramento where it outfitted 70 young men in uniforms to protect the valley. More moderate factions spent over a decade quarreling over engineering and legislative compromises like the Drainage Act of 1880 to build mega-dams on the Yuba to trap the mining debris. Nature intervened to support farmers worries that the dams would not be able to hold back the sediment in 1883 when the English dam, a 130 foot high structure, gave way. Despite the billions of tones of sediment that were already poised in mountain valleys waiting to descend in the first heavy rains, the Anti-Debris Association maintained that the dams should only be built after the hydraulicking had ceased completely so as not to give the miners an excuse to continue their destructive activities. After federal district court judge Sawyer reached his historic verdict on January 7, 1884, the arduous task of implementing the decision, which many miners refused to accept, began. Court challenges were filed, injunctions against operating the machinery were flagrantly disobeyed, inspectors were threatened with violence, but the mountain miners slowly but surely gave up the ghost of hydraulicking. The mining boom continued further north in the Yukon and in Alaska while entrepreneurs in California experimented with huge river dredges that could dig 150 feet under the bed of the rivers of the Sacramento and San Joaquin rivers. But the battle which gripped the entire north of the state is almost forgotten now. "The great pits lie quiet, remote, studded with tall pines ... There are still vast heaps of tailings in upland creeks and in the beds of the four rivers where they cross the flatlands," wrote Kelley in his conclusion in 1959.